Since 1899, members of the Wellesley community have gathered in Houghton Chapel for reflection and inspiration. 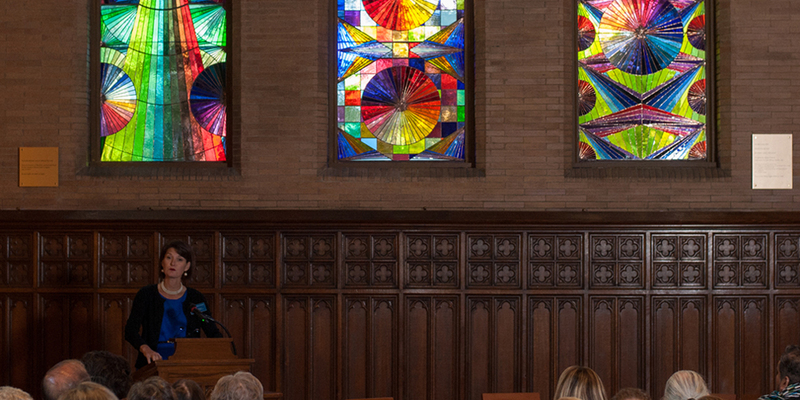 A few weeks ago, dozens of students, alumnae, and faculty came together for the dedication of three new chapel windows that celebrate the transformational effect of a Wellesley education. The triptych, given by Patricia Kopf Colagiuri ’55 in memory of her parents, Elizabeth and Rudolph Kopf, depicts the light at dawn, midday, and dusk. 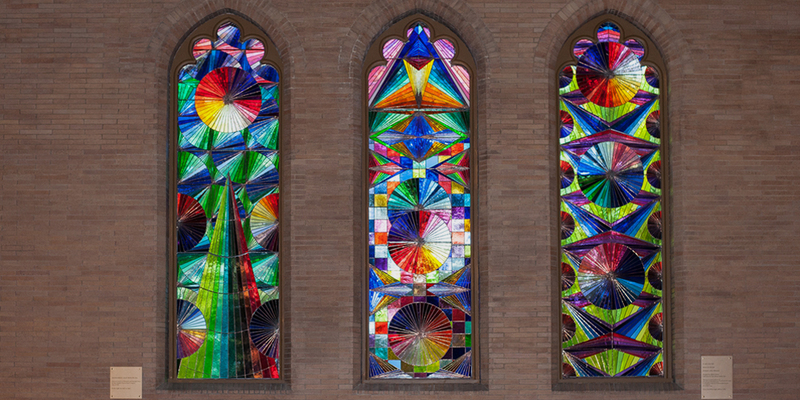 The triptych, which replaces three 10½-by-3-foot windows that had been left unfinished since the chapel’s dedication, was designed by renowned abstract artist Jeffrey Gibson, who is of Cherokee and Choctaw descent. Gibson used Photoshop to create his vision, drawing from traditional Choctaw and Cherokee designs that are often expressed through exquisite beadwork. The design was translated into stained glass by internationally known stained-glass artist Lyn Hovey. His Guatemala studio team included indigenous Mayan women weavers from the Kaqchikel tribe of Santa Maria de Jesus, Guatemala, who are world-famous for their concentration and accuracy. Together, they combined 5,000 pieces of hand-blown stained glass from France, Germany, and Poland. At the dedication, the two artists talked about the windows and their own creative processes, answering questions from Martha McNamara, director of Wellesley’s New England Arts and Architecture Program, and Daniela Rivera, associate professor of art. “Both of my grandfathers were Southern Baptist ministers, and I know how important their churches were to them and the communities that they served. Here [at Wellesley], it’s just daunting how important faith is to people,” said Gibson. 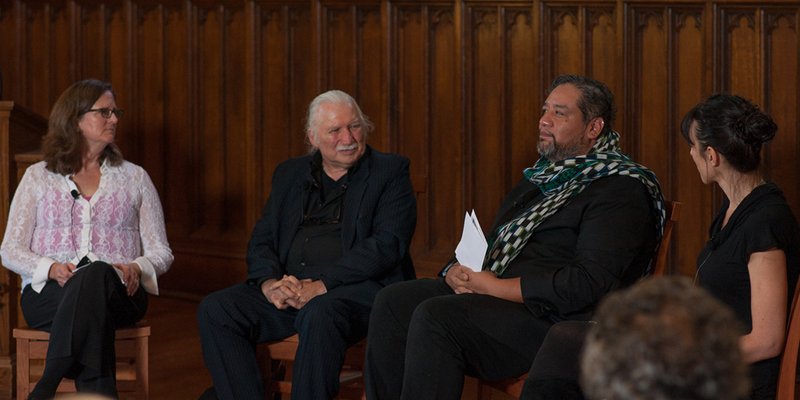 President Paula A. Johnson praised the artists’ inspiring remarks and thanked Colagiuri for her extraordinary gift, which enriches and diversifies the religious imagery within Houghton Chapel. 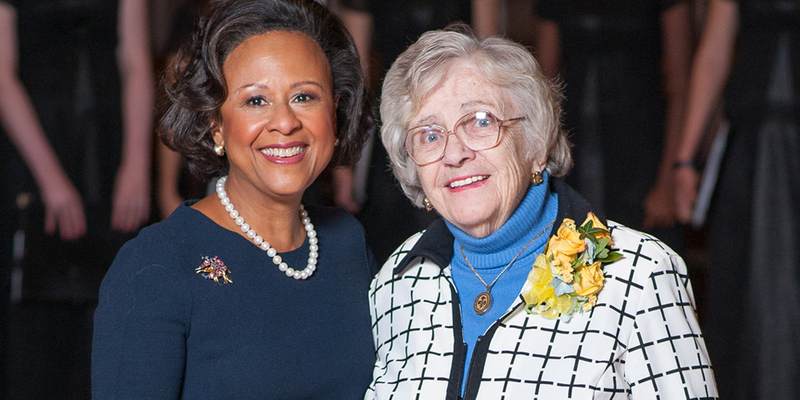 “Pat, what a legacy to leave to the College, to all of us, and especially to all of our students of all faiths. This project, which I know you shepherded passionately and with such love, has been realized so artfully and is imbued with such deep meaning,” said Johnson. The idea of spreading light continued with a blessing Steinwert wrote for the occasion, which included the lines, “May these windows become a beacon of light, offering comfort and assurance for those who walk the misty paths between light and shadows, doubt and faith, despair and hope,” and with the song “You Are the New Day,” sung by the Wellesley College Chamber Singers. Steinwert also read a timeless poem by Ponca Chief White Eagle (1800s to 1914) that is engraved on a plaque beside the windows. – as it surely will.